Spoil your dad with a special staycation! 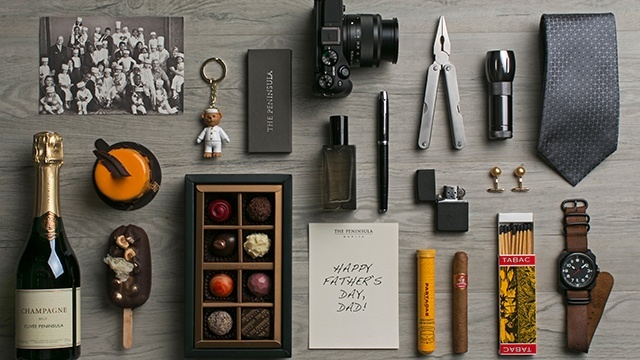 (SPOT.ph) Need ideas for Father's Day weekend? We've got some! Treat the man of the hour to a relaxing staycation where he can put his feet up for the whole weekend, complete with soothing spa treatments and sumptuous feasts that are sure to make him feel like a king. Heroes need days off, too, so make it the best weekend to remember! Aruga by Rockwell has something prepared not just for Dad, but for the whole family as well! 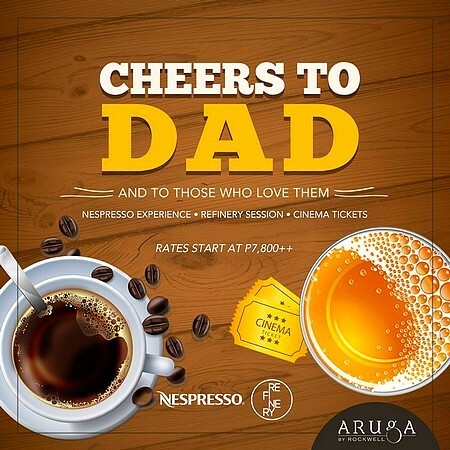 Check out their special Father's Day package—with rates starting at P7,800, you get to enjoy a stay at one of the hotel's elegantly-designed rooms (your choice of one- or two-bedroom), free breakfast, Power Plant Mall cinema tickets, and vouchers for Nespresso coffee and drinks at Refinery. Check out the Peninsula Manila's Father's Day Brunch Buffet at Escolta for a hearty lunch to celebrate Dad! For P4,400 net, feast on special barbecue dishes such as BBQ Glazed Pork Tenderloin, Beer-braised Beef Short Ribs with Roasted Potato and Mushroom Ragout, and Cajun-Spiced Salmon Fillet with Creamy Polenta, along with free-flowing champagne. And don't stop there—take your dad to Salon de Ning from 1 p.m. to 6 p.m. afterwards for the ultimate luxurious pampering experience at the Father's Day Lounge. If you spend Dad's special day at the hotel, he'll get to enjoy complimentary treats such as haircuts from Back Alley Barbershop, hand treatments from Jo Malone, and craft gin cocktails from Wine Warehouse, to name a few. Celebrate your dad at Eastwood Richmonde Hotel’s Father's Day buffet! Choose from a wide array of sumptuous international dishes and free-flowing wine and beer, all for only P1,250 per person. The best part? For every four diners, Richmond will let the fifth one eat for free! Show your appreciation for dad this Father's Day with a relaxing staycation and good food! Acacia Hotel's package includes a 20% discount at A-Steakhouse, two bottles of beer, welcome drinks for two, and other standard amenities. 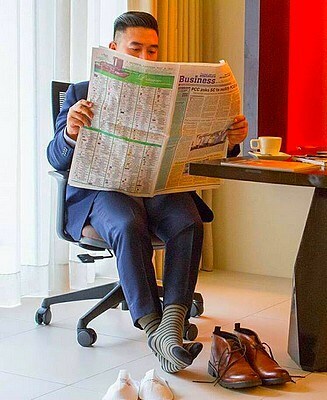 Conrad Manila has lots in store for the man of the house. Aside from their appetizing selection at Brasserie on 3, Dad also gets to bring home special treats and partake in a draft beer-tasting activity on June 16 and 17 for P2,700. Meanwhile, China Blue by Jereme Leung offers a set menu for P3,200 per person. Over at Conrad Spa Manila, sign up your Dad for an invigorating back, neck, shoulder, and foot massage, priced at P2,700. It consists of a 60-minute back and foot massage, and followed by a 30-minute personalized facial. Pamper your dad on his special day! Choose from Midas Hotel and Casino’s room offers: a Deluxe Room for only P5,199 or the Executive room at P6,199. Dad can also avail a 30-minute signature massage at the Essenses Spa and a free gift set from Rustan’s. 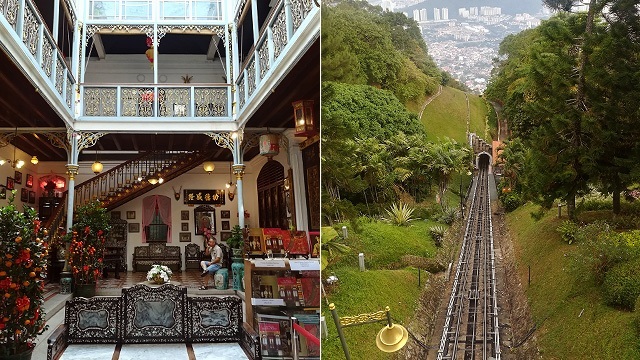 How about a staycation at the Manila Hotel for Dad and the family? Avail a Superior Deluxe Room, inclusive of buffet breakfast for two adults and two children (aged four and below), and a special dimsum lunch buffet for two at Red Jade for P7,999. Give your Dad the gift of a memorable celebration at Novotel Manila. The package, priced at P6,000, comes with buffet breakfast at Food Exchange Manila for up to two adults and two kids (aged 15 and below). Fathers also get a complimentary buffet dinner voucher and 30% discount at the buffet for his companions. 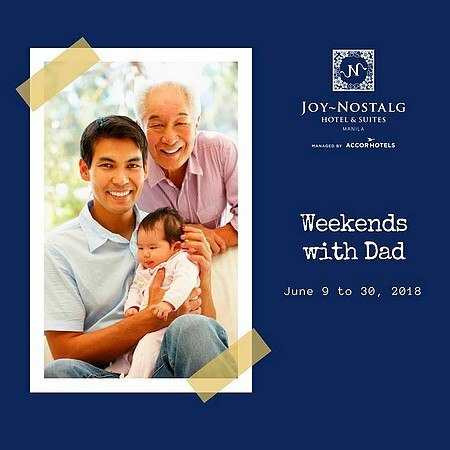 Chill with Dad on all weekends of June at New World Makati Hotel. Room rates start at P6,500, which includes P500 off at Columbia Sportswear or Mountain Hardwear, 10% discount on merchandise from Harley-Davidson of Manila, and drinks for two at The Lounge or Bar Rouge. 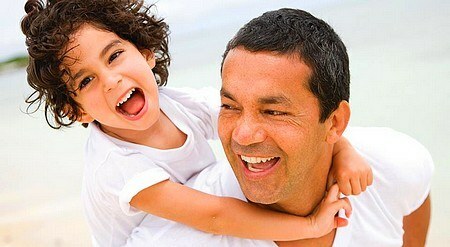 At Joy Nostalg, you can celebrate Father’s Day all month long with their Weekends with Dad package. Rates start at P6,500 for the One-Bedroom Suite, with discounts up to 50% when you and the fam stay longer. This package also includes breakfast for two. They also offer a Father’s Day Lunch Buffet at the Nostalgia Lounge & Bar. Rate is P1,200 per person. 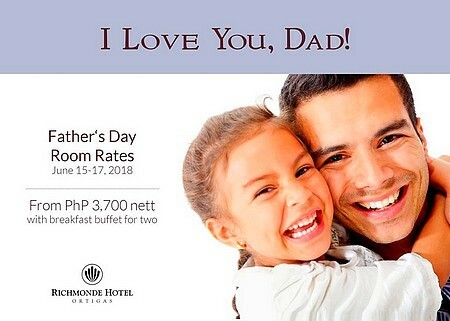 Give Dad the gift of a relaxing stay—book a room this Father's Day at Richmonde Hotel Ortigas for as low as P3,700, inclusive of a filling breakfast buffet for two and other standard amenities. The Picasso Boutique Serviced Residences celebrates Father's Day throughout all the weekends and holidays of June! Use the promo code 2018ILOVEDAD on the hotel’s website to avail this special rate when you book a room. 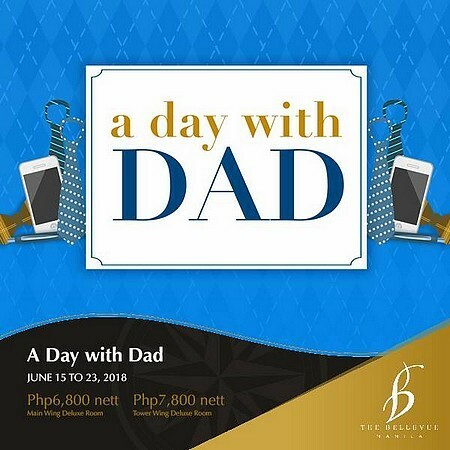 The Bellevue Manila's Father's Day room promo includes packages for an overnight stay at the Main Wing Deluxe Room for P6,800 net per night or at the Tower Wing Deluxe Room for P7,800 net per night. Other inclusions are a buffet breakfast for four (two adults and two children, aged 12 years old and below), a haircut for Dad, and a 20% discount for two other family members at Jing Monis Salon, a 15% discount on Enchanted Kingdom tickets, discounts at Sip & Gogh, a one-time 25% discount on food and beverages for lunch or dinner for four, and a surprise for Dad. 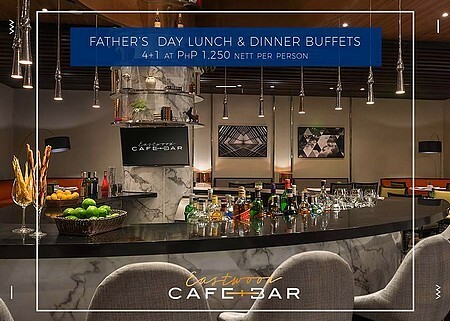 The whole family can also celebrate with a special Father’s Day lunch and dinner buffet at Café d’Asie on June 17 for only P1,800 net per person. Have brunch with Dad at Makati Diamond Residences’ Alfred restaurant and top up with a bottle of champagne to celebrate this festive occasion. This offer is available at P2,000 net per person on June 17 from 11:30 a.m. to 2:30 p.m. 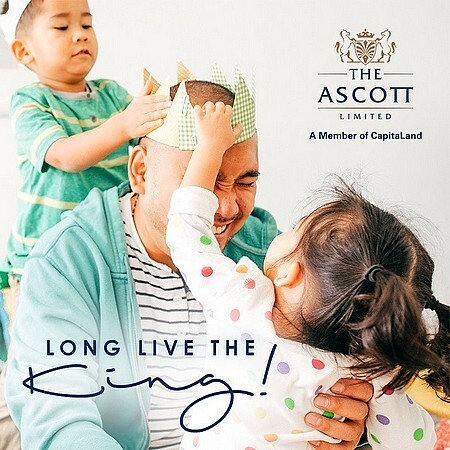 Treat Dad this weekend of fun at Ascott Makati with rates as low as P7,200 net, inclusive of breakfast for two! Dad also gets a 20% discount on services from John Barbers during your stay at the hotel. 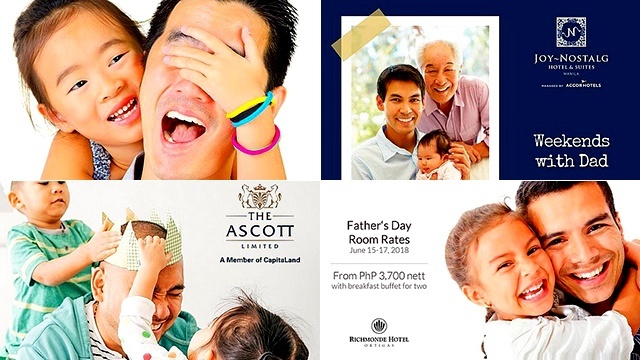 Book a room and use the promo code ASCOTTDAD2018 to avail this offer. This Father's Day, take Dad to Diamond Hotel for an indulgent all-star weekend. 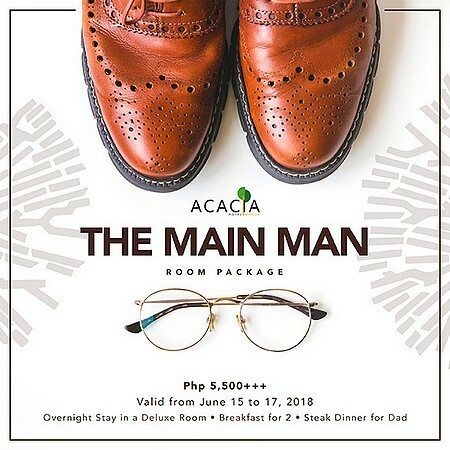 The Dad Indulgence package goes for P8,500 net and includes accomodations at a Deluxe Room, inclusive of breakfast buffet for two at Corniche, a one-time meal for two (choice of lunch or dinner), and 20% off on massage services. If your family's not really up for a staycation, check out Corniche's extensive buffet spread (P2,980 net per person) for your lunch or dinner celebration.